"[Kavanaugh] is looking for someone who can make sure his defense is solid…and a woman at that," one source familiar with the preparations told NBC News. WASHINGTON — In preparation for what may be a high-stakes week of testimony, Supreme Court nominee Brett Kavanaugh has retained an experienced Washington trial attorney, Beth Wilkinson, while the woman accusing Kavanaugh of sexual assault, Christine Blasey Ford, has hired strategist Ricki Seidman, who has Democratic ties and readied Anita Hill to testify in 1991. Ford has left open the possibility of sharing her story in a public setting before the Senate Judiciary Committee as long as the committee agrees to "terms that are fair and ensure her safety," but no date is yet set in stone. Judge Kavanaugh has denied Ford's allegations that he assaulted her in high school and is preparing to provide his defense before the committee with the help of Beth Wilkinson, sources tell NBC News. Wilkinson has been the lead counsel in more than 50 jury trials, according to her bio with her firm, Wilkinson Walsh Eskovitz. Both Wilkinson and her firm declined to comment on her position. "Her experience tells you everything you need to know about Kavanaugh's strategy," said a source close to Wilkinson. "He's not looking for someone who could have helped him prepare for a normal confirmation process. He's looking for someone who can make sure his defense is solid … and a woman at that." Wilkinson is also a close friend of Judge Merrick Garland, former President Barack Obama's Supreme Court nominee who was never confirmed by a Republican-controlled Senate, and is married to David Gregory, former host of NBC's "Meet the Press." 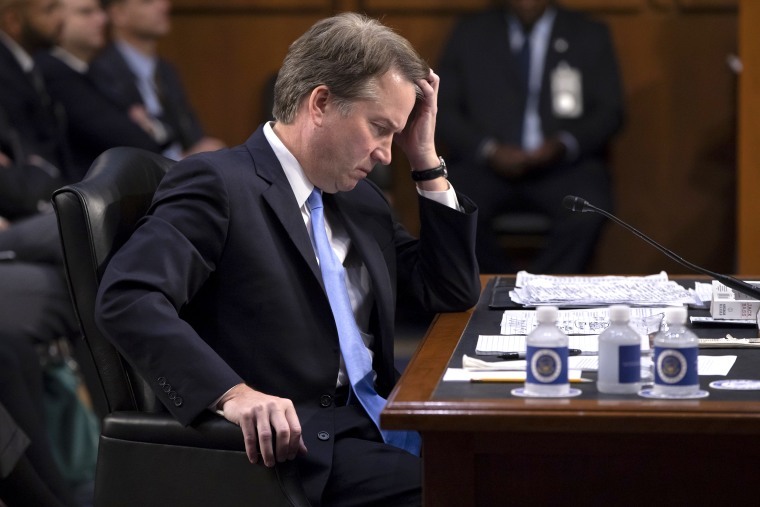 According to a person involved in Kavanaugh's confirmation process, the Supreme Court nominee spent roughly two hours on Tuesday prepping for the possibility of testifying again. He was grilled by a small group of senior White House staff about his past, his dating life and his accuser. "It's really in the nominee's hands," said the source involved in his confirmation process. "It's his reputation and he knows all the facts." In addition to her lawyer Debra Katz, Ford hired communications strategist Ricki Seidman, who helped prepare Anita Hill for her testimony more than two decades ago when she accused then-Supreme Court nominee Clarence Thomas of sexual harassment. Seidman also worked as communications director for Joe Biden during the 2008 campaign after he was named Obama's running mate. Hill has said Biden owes her an apology for how she was treated by the Senate Judiciary Committee where he served as chairman during her testimony in 1991. In 2009, Seidman helped Obama's first Supreme Court nominee Justice Sonia Sotomayor prepare for her confirmation process. And she served in the Clinton administration as deputy communications director. Despite growing up in Washington, Ford has few ties to the inner workings of national politics in the capital. Her hiring of Seidman may help her prepare for testifying before the Senate, but Seidman's Democratic ties could make allegations appear partisan, according to a source who has prepared previous Supreme Court nominees for the confirmation process.